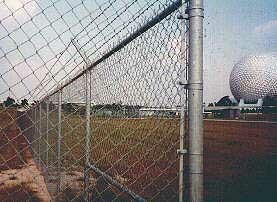 Highly versatile and durable, Chain link fencing offers total visibility while being very resistant to defacement. Chain link fencing, when integrated with your landscaping plan, provides an attractive visual barrier while retaining the benefit of security. We have many years of experience installing chain link in homes, factories, warehouses, amusement parks, ball parks, playgrounds, schools and even prisons. • Use only large post 2" line: 2 1/2" terminal min. • Post set in approx. 2' of concrete: min. Whether vinyl coated in color, galvanized or aluminized our skilled craftsmen will install your chain link fence to the highest standards, guaranteeing years of trouble free satisfaction. 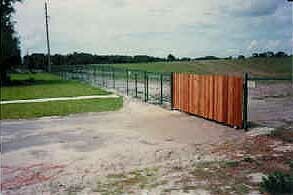 Two of our many styles of chain link are shown below. To see more installations including railing, decks and automatic entry gates, please take a moment to view our galleries. You may also click here to request a no obligation, free estimate from an Allied representative.